The global water-based coatings market has been witnessing considerable transformation, says Transparency Market Research (TMR). During 2015, the top three market players, Akzo Nobel, PPG Industries, and Sherwin Williams together accounted for a share of nearly 55% in the global water-based coatings market. A large number of vendors are focusing on the adoption of business strategies such as acquisitions, collaborations, partnerships, and mergers in order to achieve a strong foothold in the worldwide market. Some vendors are also extending their production capacities. For instance, in April 2017, Flint Group announced the completion of its new production site in Germany, where a number of new formulations and specialty coatings will be made available. The global water-based coatings market was valued at US$46.1 bn during 2015. By the end of the forecast period, the market will have attained a revenue worth US$80.3 bn, expanding at a profitable CAGR of 6.40% between 2016 and 2024. By end-use industries, the building and construction segment surfaced at the fore, achieving more than 58% of the global water-based coatings market. The growth of the building and construction industry segment can be attributed to the growing number of construction projects across several parts of the globe. The robust infrastructural development and upgrading activities in developing regions of Europe have also been responsible for the growth of this segment. 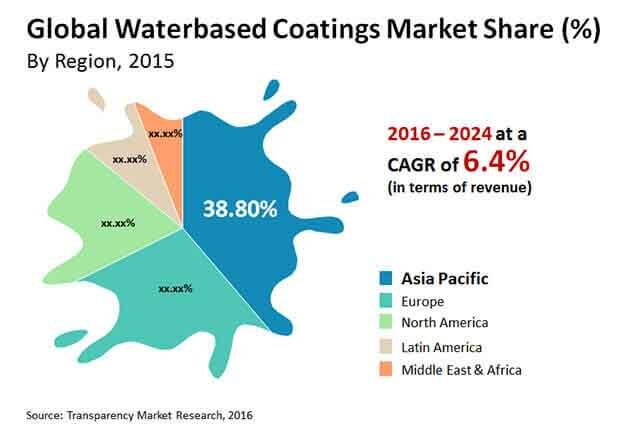 By geography, Asia Pacific emerged as the leading segment in the global market for water-based coatings in 2015. The robust development of infrastructure across several countries in this region has been promoting the expansion of the water-based coatings market in this region. It will expand at a CAGR of 7.0% during the forecast period. China is expected to lead the market for water-based coatings in Asia pacific, followed closely by India. “The global market for water-based coatings is receiving great impetus from infrastructural growth taking place all over the world,” said a lead TMR analyst. As the economies of several developing and developed nations expand, the public and private spending on infrastructure is also likely to increase. Therefore, the innumerable construction projects such as smart city and metro railways will present favorable opportunities for growth. All these trends have created an environment conducive to growth of the water-based coatings market. Moreover, the emerging economies such as the Middle East and Africa, and Latin America are also displaying high demand for water-based coatings. The GCC countries in particular are focusing on the development of commercial sectors such as tourism, hospitality, and healthcare. As a result, the global market for water-based coatings might progress to a considerable extent. On the other hand, the declining demand from European and North American nations might enfeeble the growth prospects for the market over the forthcoming years. Despite the economic revival of the European Union, the greater part of opportunities are to be found in Asia Pacific. The presence of strict government regulatory frameworks regarding VOC contents can also impede expansion. Nevertheless, the rising environmental concerns have been resulting in the development of eco-friendly water-based coatings, ensuring the expansion of the global water-based coatings market.